Commercial hot water and heating specialist, Adveco’s TOTEM micro combined heat and power (m-CHP) based system for Bromsgrove’s new Leisure Centre has been named as a Renewable Project of the Year finalist in the 2019 Heating & Ventilation News Awards. 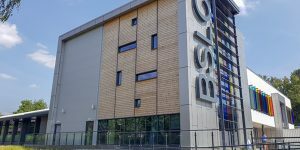 As part of a wider local redevelopment project by Bromsgrove District Council, the new sports and leisure centre demanded a high-performance heating system. To achieve the level of energy efficiency required for this modern building, Yorkshire Building Services Ltd (YBS) designed, and Adveco provided, a system based on its Totem T25 m-CHP to reduce emissions and improve total efficiency. “To have a customer’s project selected is especially gratifying, celebrating the professionalism of our contracting and installation partners and our customer’s decision to put their trust in us. It also one of the finest ways to showcases our commitment to sustainable technology that meets and exceeds the need for carbon reduction and the lowering of emissions,” said David O’Sullivan, managing director, Adveco. The state of the art building features two large swimming pools, a sports hall, a 100-station gym, a fully featured spa and a café, so was a prime opportunity to display the sustainable potential of an m-CHP system. Electricity is produced and consumed on-site reducing the building’s reliance on the local grid. The waste heat produced is captured through a series of heat exchangers and used towards the high heat demand of the system. With the significant continuous demand made by the Bromsgrove site, the m-CHP system drastically reduces the reliance on conventional boiler technology and improves the overall efficiency of the building. The site is on target for a net reduction in carbon emissions of more than 65,000 kg per year as well as providing an estimated £10,000 in annual savings to the District Council which runs the facility. Designed as a boiler pre-fed system, allowing the m-CHP unit to maximise its input by prioritising the higher energy demand present in the building’s heating system, Adveco supplied a TOTEM T25 m-CHP appliance as well as a bespoke 3000-litre buffer vessel, including controls and ancillaries, to serve the building’s heating system. Adveco additionally supplied two A.O. Smith BFC120 condensing water heaters to serve the domestic hot water supply to the leisure centre. Learn more about the Bromsgrove Leisure Centre project.